Here is something I haven't done many paintings of - flowers in a vase. Usually, I locate them in the garden or zoomed in close. 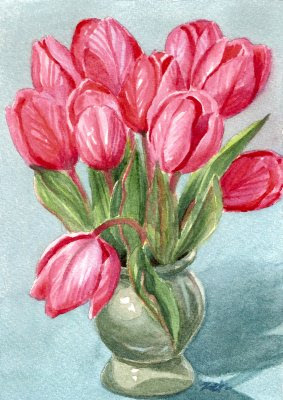 But, I have a vase of tulips and they were beckoning me to paint them. So, here they are. Since nothing's blooming outside, it makes a perfect floral subject for winter.